It has been a while since I wrote a What I’m Reading Wednesday post! But in the name of doing better at this blog thing, here I am! 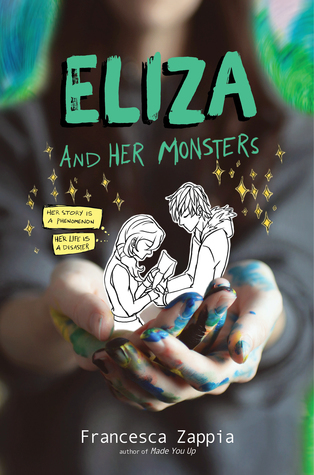 I’m almost finished with Eliza and Her Monsters by Francesca Zappia. It is actually my first read for the Beat the Backlist Challenge! This book is ADORABLE and REAL. It follows Eliza Mirk, the author of a well known webcomic, Monstrous Sea. The only thing is, Eliza is still a high schooler and no one knows she is the infamous author. Well, almost no one. She only trusts a few of her friends, but the thing is they are online friends. So Eliza spends a lot of time in her own head, in her bedroom, drawing for the webcomic and chatting with her friends. As you can imagine, her parents are unsure how to handle it all because she has very athletic and “involved” younger brothers. So basically she feels like she doesn’t even belong with her own family. Until the day she meets a Monstrous Sea fan at her high school. She finally feels a connection to someone that she can be with in the flesh. It’s an all new experience for her and it’s absolutely charming and adorable to watch. This book was an OwlCrate pick from May of 2017 and I’m so happy to finally read it!